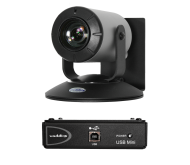 The USB Mini was designed to provide simple and effective USB 2.0, 720p/30 streaming and capture capabilities without the need for local analog or digital video outputs. 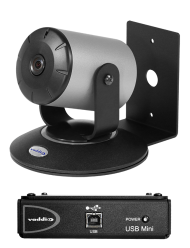 The USB Mini uses UVC (Universal Video Class) drivers, so whatever resolution the UC application needs, the USB Mini will auto negotiate. 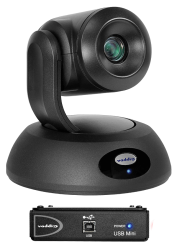 The USB Mini powers the camera, returns HSDS (differential) video with connectivity distances up to 100' using the Vaddio standard two Cat. 5 wiring platform. The USB Mini also offers an easy mounting either on-wall or under-table with an integrated mounting tab.